After closing out the ROK Cup USA portion of the 2015 Cold Stone Florida Winter Tour with a fifth place in the overall championship, Gangi Jr. would be back in action the following weekend looking for more. Taking to the Ocala Gran Prix circuit in Ocala, Florida for the final Rotax MAX Challenge event, the GT7 Motorsports/Tony Kart pilot saved the best for last, taking the final round win and making his way onto the Rotax Junior podium. Taking on official qualifying under rainy conditions on Friday, Gangi Jr. used his wet weather skills to clock third in the timed session. Advancing to the Super Pole session, which was moved to Saturday due to the severe weather threat in the area, the multi-time champ maintained his third place effort, a mere 0.08 seconds off the pole time. Moving on to three progressive heat races, Gangi Jr. placed fourth, second and fourth during the wheel-to-wheel action to line up third for Sunday’s prefinal. 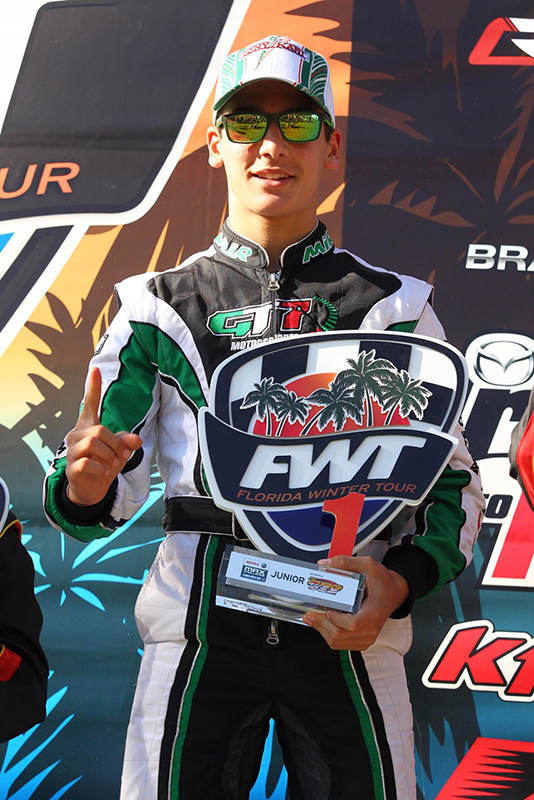 Starting on the preferred inside front row for the second-to-last on track event of the 2015 FWT, Gangi Jr. held his third place position against the stacked Rotax Junior field. Again starting on the inside of row two, this time for the main event, Gangi Jr. took advantage of the start to move into the lead. Pressured by his competition in the early laps, the Mike Doty-tuned driver soon pulled out to an advantage over the rest of the field. With lapped traffic coming into play in the closing stages of the 22-lap race, Gangi Jr. was able to maintain focus and the lead to earn a huge win at Ocala. Heading into the finale round sixth in the Rotax Junior points standings, Gangi Jr.’s effort in Ocala propelled him onto the third step of the championship podium. With a Rotax MAX Challenge Grand Finals ticket still on his mind, the GT7 Motorsports driver will look to secure his at the United States Rotax Grand Nationals this August. Up next for Gangi Jr. is Round #1 of the ROK Cup USA series at the Ocala Gran Prix April 17-19. The following week, Gangi Jr. will be back on track for the opening round of the 2015 United States Pro Kart Series, April 24-26 at the GoPro Motorplex in Mooresville, North Carolina. Anthony Gangi Jr. would like to thank tuner/driving coach Mike Doty, Brian Krummel for tuning assistance, Chad Brackens of Race Data Dynamics for all the data support, Daniel Lambert (Disco Dan) for the always-great power, as well as sponsors GT7 Motorsports, Millwork Solutions, Hole Shot Drive Systems, PKT, and Hot Head Engine Preheaters.